This is the perfect quick and easy weeknight dinner item. 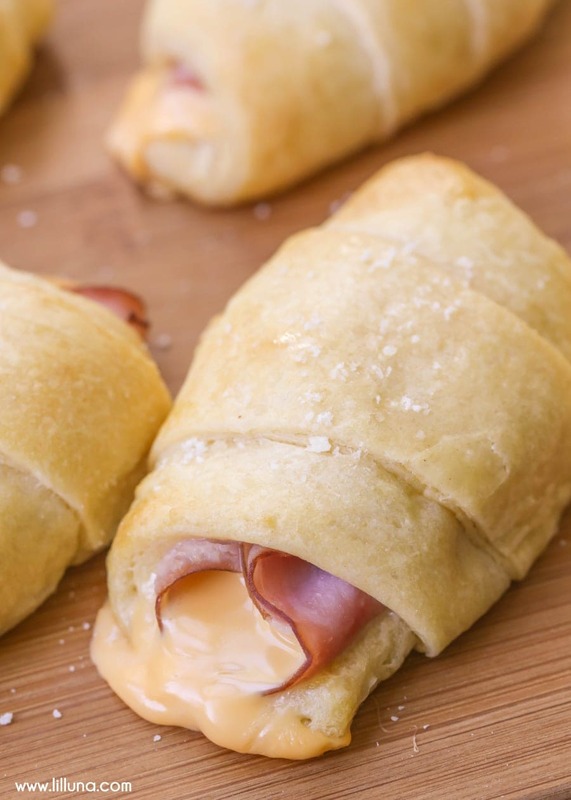 Hot ham and melted cheese wrapped up in a buttery crescent roll – yum! 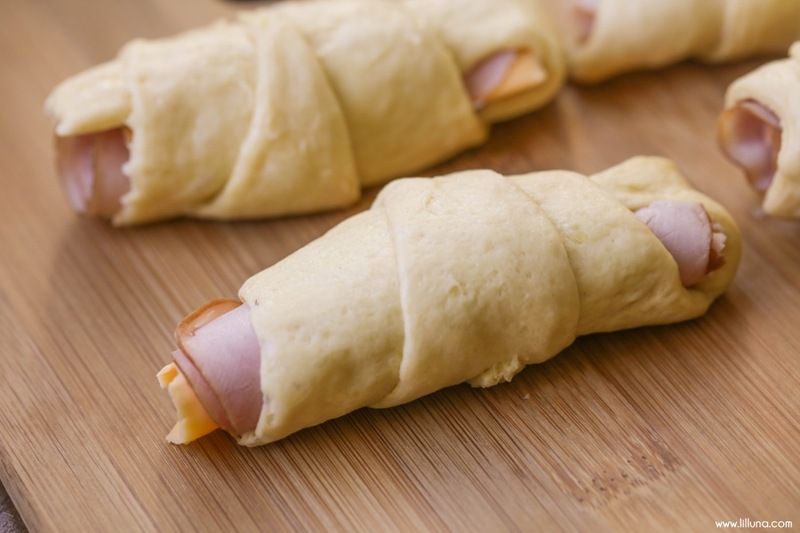 These ham and cheese roll ups only require THREE ingredients and are always a hit with kids! I think we can all agree that life is crazy. I feel like life is especially crazy this time of year when there is so much going on, which means if there are areas of life that can be simplified, you better believe I’m going to simplify. One of those aspects is dinner. No need for full course meals in December, especially when there are so many treats being made. Instead, I like to rely on some of my favorite, quick dinner recipes that are ones all the kids will enjoy. 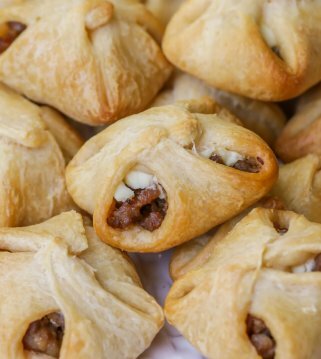 One of those recipes are these Hot Ham and Cheese Roll Ups. Fill with ham and cheese and roll up. Put the crescent triangles on the cookie sheet and add 2 slices of ham and 1 piece of cheese to each crescent. Roll up each crescent and place them with the seam facing down on the sheet. Spray the tops of the roll-ups with butter spray – this is totally optional! If you don’t have butter spray, you could brush/spoon some melted butter on top. Bake at 375° for 11-12 minutes. Sprinkle grated parmesan cheese on top before serving (again, totally optional!) and ENJOY! These were so soft, tasty and enjoyed by the whole crew which means we’ll definitely be making them again. This time around, we used ham with American cheese, but I’m going to try some other meat + cheese combos! I’m thinking maybe turkey and Swiss next time. 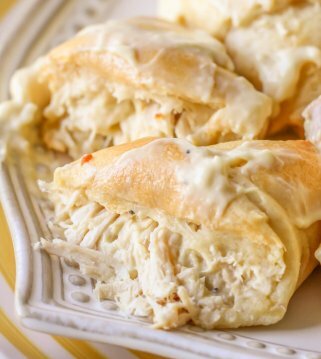 Honestly, these would taste amazing with any combination, so throw on your favorite sandwich meat and cheese and give it a go! This is the perfect quick and easy weeknight dinner item. 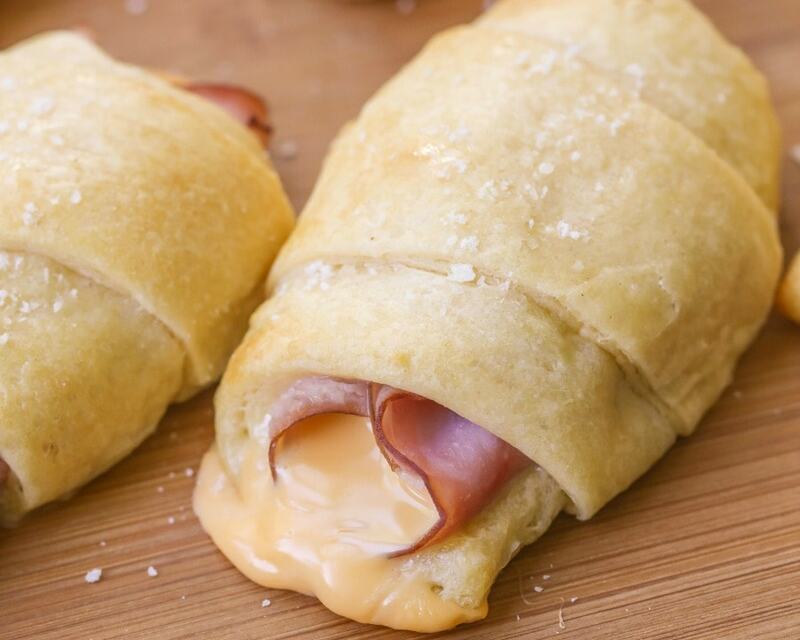 Hot ham and melted cheese wrapped up in a buttery crescent roll - yum! 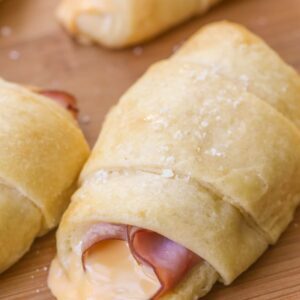 These ham and cheese roll ups only require THREE ingredients and are always a hit with kids! Place triangles on foil-lined cookie sheet. Add 2 slices of home to each triangle along with 1 piece of cheese. Roll up and place seam-side down on sheet. 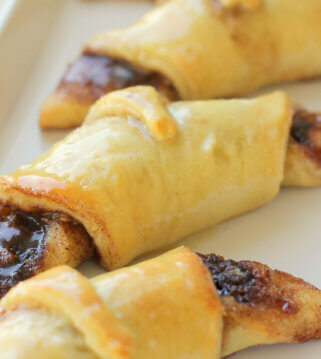 Repeat for all crescent rolls. Spray the tops of the roll-ups with butter spray before baking (optional). Bake for 11-12 minutes. If you like, sprinkle grated parmesan cheese on top before serving. Enjoy warm.